This walk: 2011-10-19. Burrator Quarry, Yennadon Crags / Cleag / Claig / Click Tor, Sheepstor, Burrator Reservoir, Leather Tor, Burrator Halt, oak tree, dam, lichen, Devonport Leat, beach, Down Tor, Lowery Barn, sett makers' bankers. Seen in Burrator Quarry car park: I remember 40 years ago (1970 et seq.) that there was a large plaque attached to this rock face saying what it was. 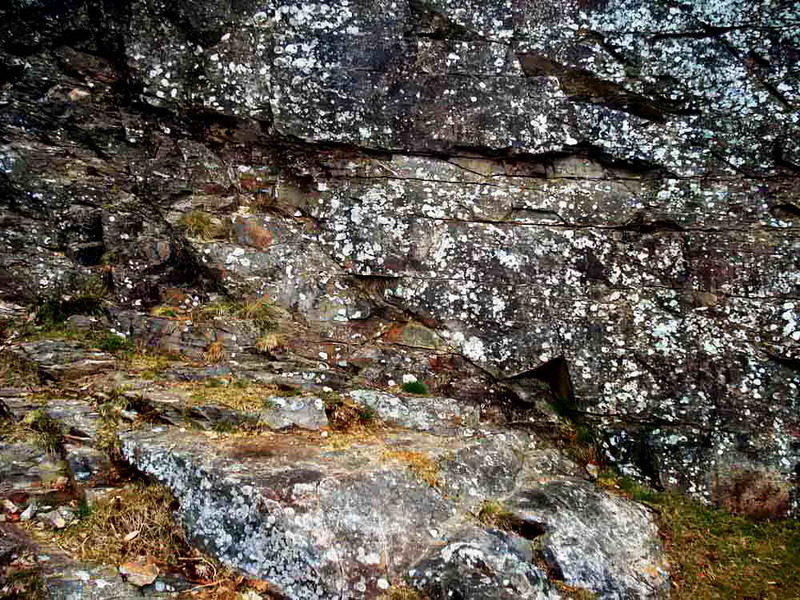 From Devon County Council's "Geology in Devon" online publication: Quote - "The Upper Burrator Quarry offers an opportunity to view a rare exposure of the contact between the Dartmoor granite and Devonian rocks. Indeed, veins of pink granite can be seen penetrating these rocks which were once slates resulting from the deep burial and intense deformation of mudstone originally laid down in marine conditions. However, the high temperatures that resulted from the intrusion of the hot granite transformed them into recrystallised rocks known as hornfels. Minerals such as black tourmaline have been formed in the original slate." Dartmoor granite is about 280 million years old, (= Late Paleozoic Era, Permian-Carboniferous Period) the Devonian rocks are about 370 million years old (= same era, Devonian Period). 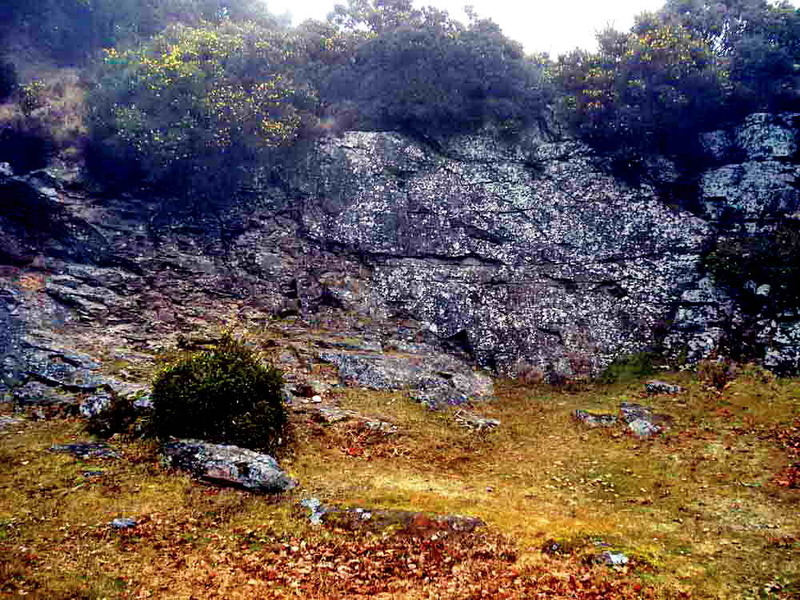 Addendum: Another reference (from DNPA) has been given to me that states: "This site features rare exposures of the contact between the Permo-Carboniferous Dartmoor Granite and Devonian country rocks of the Kate Brook Formation. The contact is highly irregular and shows evidence of mobilisation of the metasediments and segregation of felsic and mafic constituents. The contact country rocks have been thermally metamorphosed to form hornfels with extensive tourmalinisation." The area is a SSSI - Site of Special Scientific Interest. The stone from the quarry was used to raise Burrator dam by 10 ft. in 1923-1928. A close-up of the interface between the granite and the Devonian rocks, running from top-left to bottom-right. The Devonian rocks are on the left and the granite is on the right. Gathered at Yennadon Crags / Cleag / Claig / Click Tor, at SX 5498 6794, above the quarry. Complex geology in this area. The minor tor with Sheepstor behind. View along Burrator Reservoir to Leather Tor. Looking down across to the beach around the reservoir, the dam is seen at bottom right. Zoomed view to the church at Sheeptor village. Steps at Burrator Halt going up from the railway track. Steps going down to the dam. Wikipedia - Princetown Railway: First proposed by the South Devon and Tavistock Railway Company as early as 1852 the line was authorised in 1878 and did not open until 11 August 1883. On opening the line ran from Horrabridge through Dousland to Princetown. In 1885 the newly opened Yelverton replaced Horrabridge as the start of the line and three other stations were added to the line in the 1920s and 1930s, Burrator and Sheepstor Halt in 1924, King Tor Halt in 1928, and Ingra Tor Halt in 1936. The line was operated by the Great Western Railway, but owned by the Princetown Railway until January 1st 1922, when the line became part of the GWR network. The line passed to British Railways (Western Region) in 1948 and closed on 3rd March 1956. An oak tree with an interesting shape, growing towards the west, away from the reservoir. I believe this was a Common, English or Pedunculate oak (Quercus robur), whose acorns are born on stalks or "peduncles" whereas in the Sessile Oak (Quercus sessilis), they are born directly on the branches. This tree had leaves with wavy areas going onto their stalks instead of merging directly onto the stalk. Burrator dam: the reservoir was opened in 1898. It replaced the old Plymouth or Drake's Leat that was built in 1591, with its origin somewhere under the reservoir, coming off the River Meavy. The old leat was prone to drying up in summer and freezing in winter. Another memorial along the track. The modern termination of the flowing section of Devonport Leat, down the plug hole! The leat was opened in 1801 to supply "Plymouth Dock" or Devonport as it became officially known in 1823. It supplied the growing towns of Devonport and Stonehouse (Plymouth already had Drake's Leat). About half of the water goes to Dousland treatment works and the rest goes down the waterfall into the reservoir: see 22nd July 2011 walk. An old railway sett used as an edging stone on the end of the leat. Moor Strollers gathered beside Drake's Leat at the point where the flowing water disappears down the plug hole! A coarse filter, of sorts. Unfinished edging along the leat where it has eroded. The leat, flowing quietly. It was along here somewhere that Jess made her amazing leap, clearing the leat only to land in soft mud alongside it! Unusual view of the leat where it has passed under the road from Lowery Cross down to the reservoir. An odd piece of stone-working used low down in the wall, a few yards up the Lowery Cross road (on the west side) from where it meets the road around the reservoir. On the beach again, the water level was low and a wall of blocks was visible possibly all around the reservoir that might have been the original maximum level prior to it being raised 10 ft. in 1923-1928? The lining blocks are better seen in this photo, especially across the water: the dam is also seen. View up the reservoir towards Down Tor. A tree with an interesting shape. Zoomed view to Down Tor. Light and shade, looking down to the water. Internal view, from one end. Crossing the leat at SX 5555 6936. A wide, flat-canopied hawthorn tree with a lot of berries - another bad winter to come? The third, at SX 55475 69571 (the fourth was not photographed successfully). Another oak, again shaped away from the water, as the wind comes up the slope from the reservoir, this time from the south. The site of Lowery Crossing: manned until 1927 by people who lived in a cottage on this site. After they left, the gates were kept open for the train. 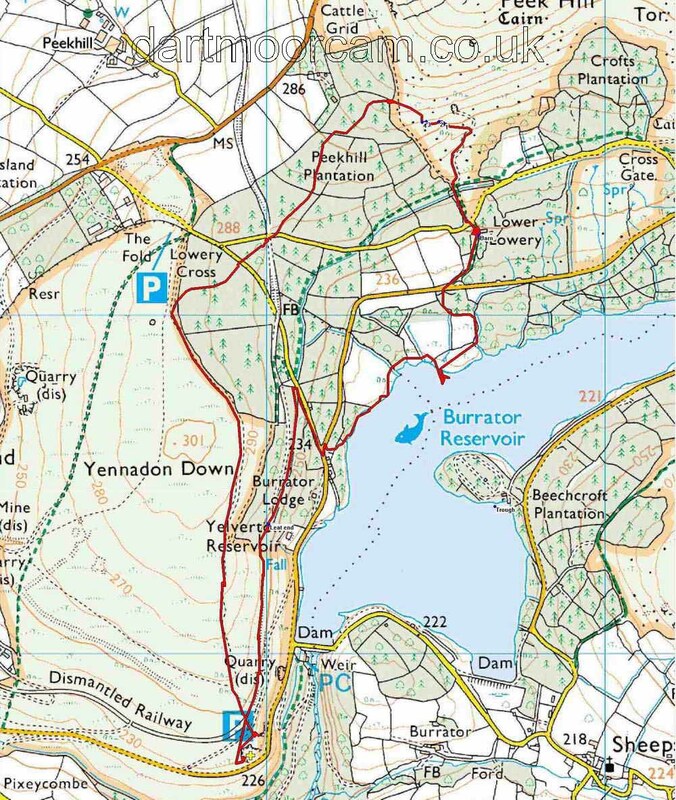 This walk was accessed easily from Dousland by parking at Burrator Quarry, marked by the P symbol and the yellow cross on the map.